Cut an A6 card (6 1/4” x 4 1/2”) from 100lb. white cardstock. Cut a rectangle from Soft Finish 85lb cardstock 6” x 4 1/4”. Adhere rectangle to A6 card. Die cut Els van de Burgt Studio Fitted Frame 1/Lace Rectangle (1061) using a paper from Graphic 45’s “A Christmas Carol” collection with Clear Double Sided Adhesive Tape on the back. 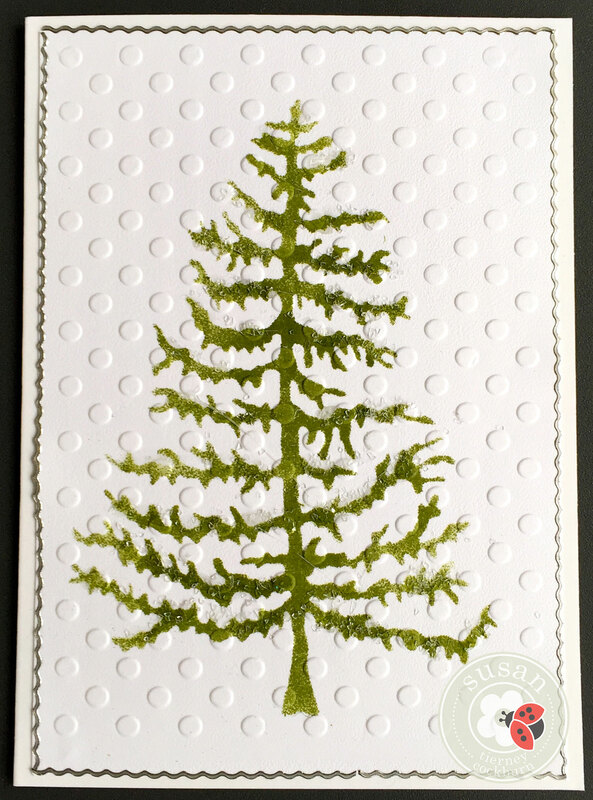 Die cut CountryScapes – Woods 4 Holiday Evergreen & Trimmings (1093) in a contrasting paper, also backed with Clear Double Sided Adhesive Tape. Cut an A6 card (6 1/4” x 4 1/2”) from 100lb. white cardstock. Cut a rectangle from Soft Finish 85lb cardstock 6” x 4 1/4”. 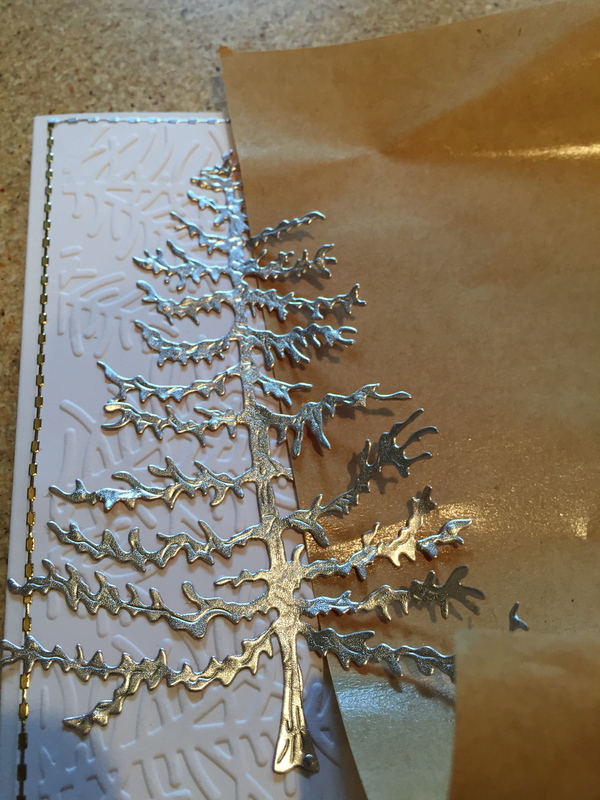 How to emboss using a die: Instead of using a cutting plate on the bottom of your die cut machine, replace it with 6 Leaf Pads (Susan’s Garden Club). Use a piece of tacky tape to hold the die in place on the rectangle and lay it on top of the Leaf Pads. Place a cutting plate on top and run it through your machine. The die will make an impression in the paper. Adhere this rectangle to the card. Die cut Suzanne Cannon’s ‘A Way with Words’ – ‘Merry Christmas’ (1056) in gold paper backed with Clear Double Sided Adhesive Tape. Adhere to the front over the impression. 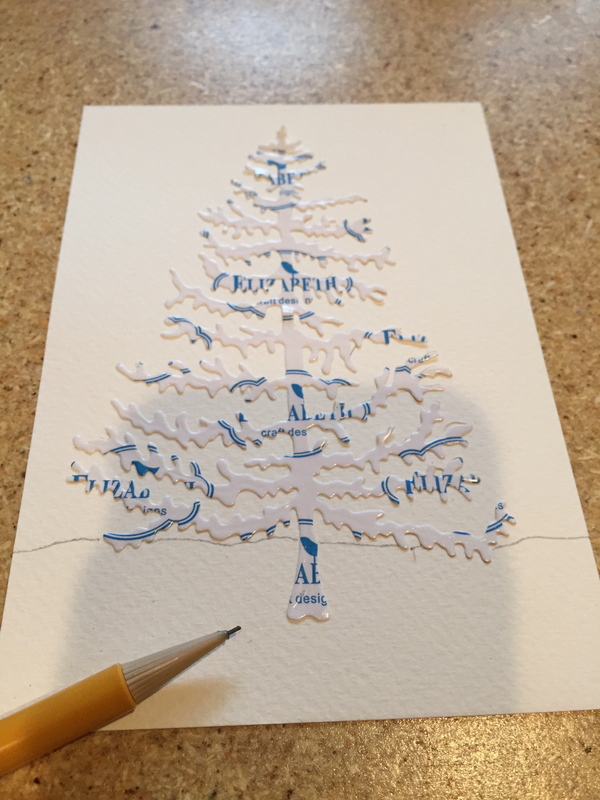 I used Elizabeth Craft Designs’ Peel-Off Stickers #1134/Gold to outline the card. Click here for a helpful video on Peel-Off Stickers. Cut an A6 card (6 1/4” x 4 1/2”) from 100lb. white cardstock. Cut a rectangle from Soft Finish 85lb cardstock 6” x 4 1/4”. Use embossing folder Sprig (E127) on the rectangle. 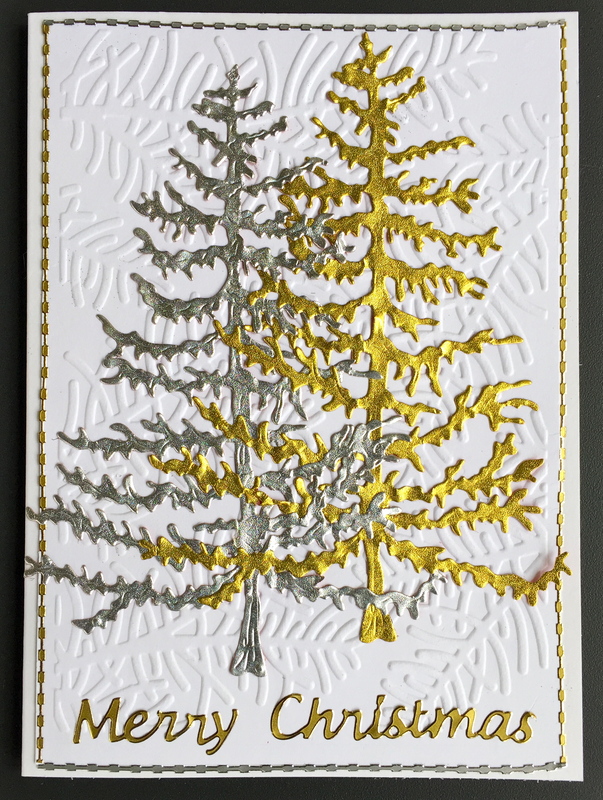 Die cut CountryScapes – Woods 4 Holiday Evergreen & Trimmings (1093) in gold and one in silver paper backed with Clear Double Sided Adhesive Tape. Click here for a helpful video on embossing folders. Adhere rectangle to A6 card. Adhere the trees. If you would like an “entwined” look, lift up the silver branches before adhering the gold tree, then criss-cross the branches. Add a Peel-Off Stickers (1016), two sides in Gold and two sides in Silver. 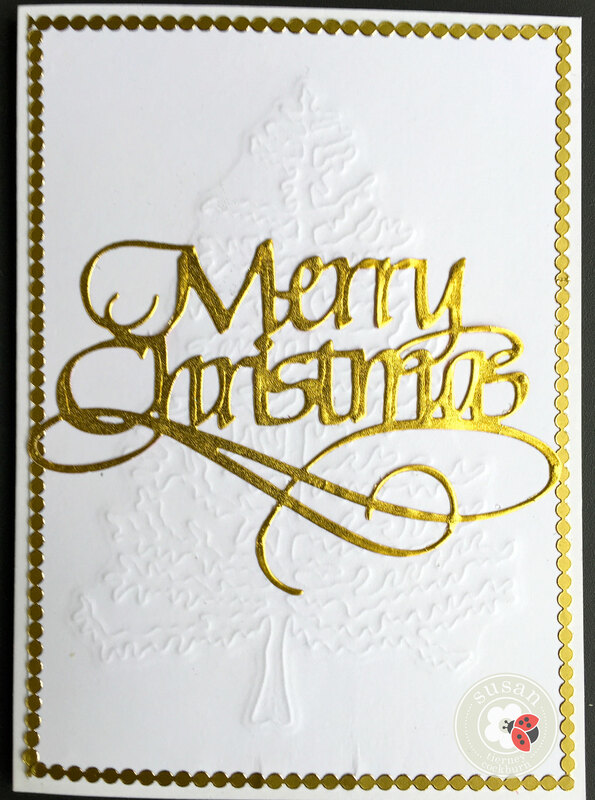 Use Peel-Off Sticker ‘Merry Christmas’ in gold (2576) to add sentiment. Cut an A6 card (6 1/4” x 4 1/2”) from 100lb. white cardstock. Cut a rectangle from Elizabeth Craft Designs’ Watercolor paper 6” x 4 1/4”. 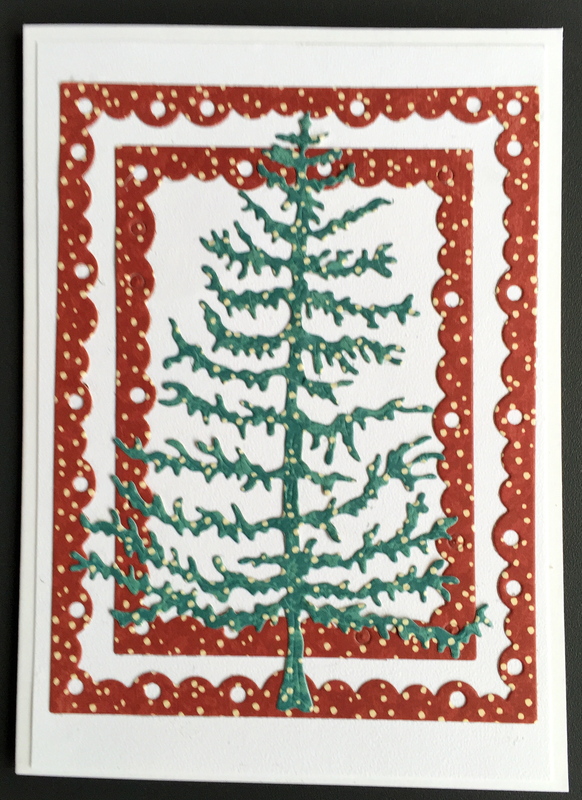 Die cut CountryScapes – Woods 4 – Holiday Evergreen & Trimmings (1093) from a sheet of Clear Double Sided Adhesive Tape (save the sheet to use as a stencil for Card #5). 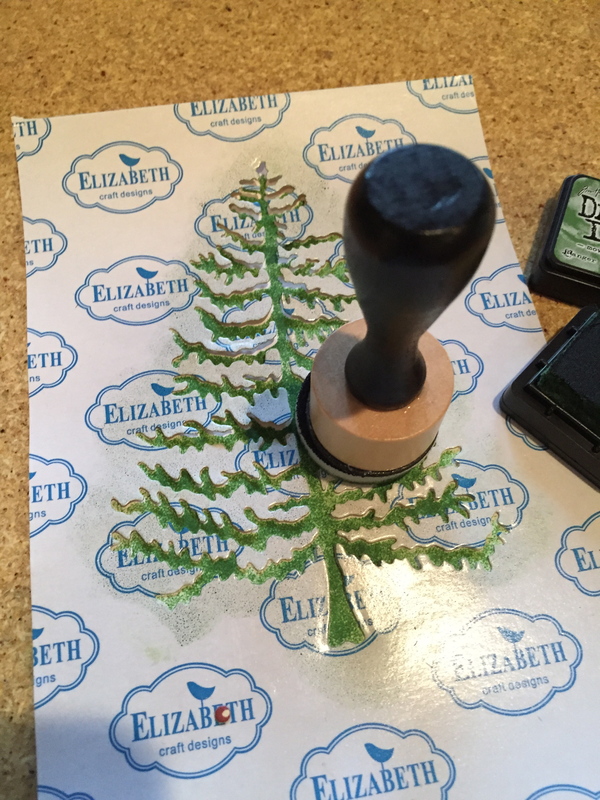 Adhere the Evergreen tree to the watercolor paper and press down. Lightly draw a horizon line with a pencil. 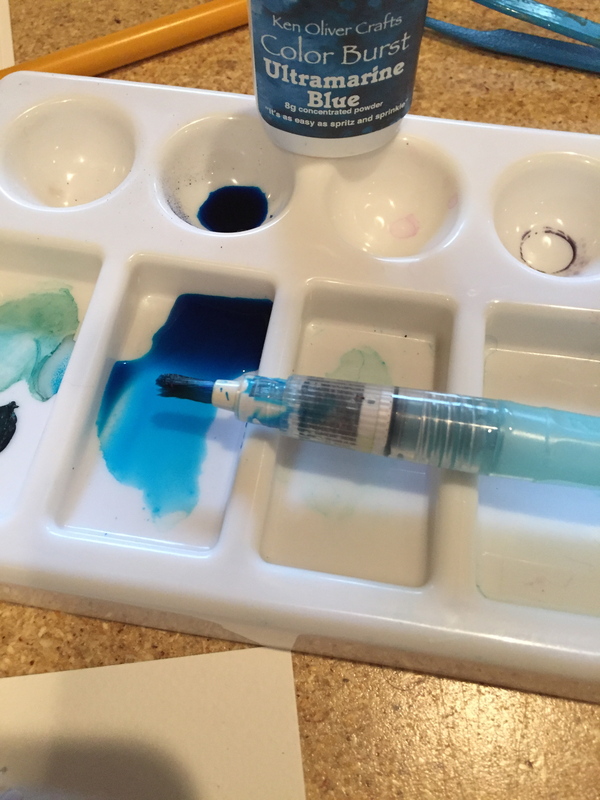 Mix Ken Oliver’s Color Burst/Ultramarine Blue in a mixing tray with water. Use a water brush to apply watercolor for the sky. Allow to dry completely. Adhere the rectangle to the A6 card. To add “shadows,” I use Copic B000. Peel away the Clear Double Sided Adhesive Tape carefully. 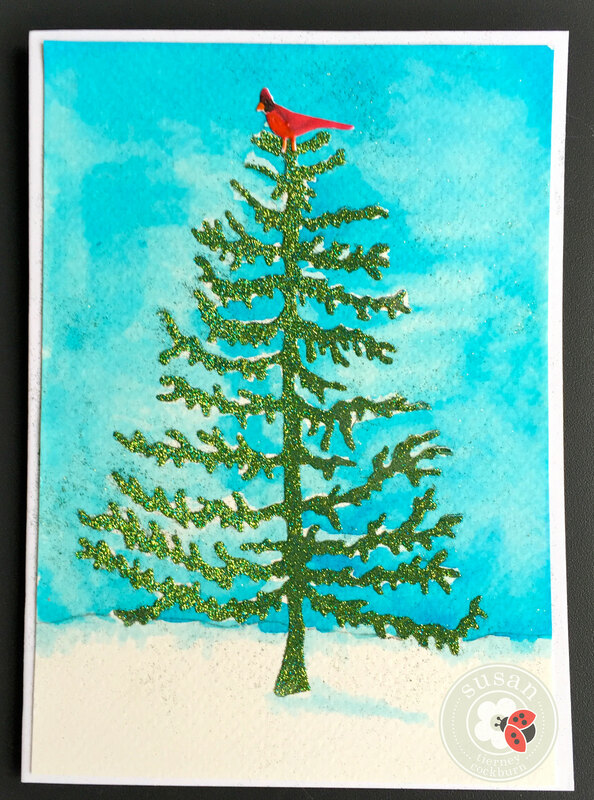 Mix Elizabeth Craft Designs’ Silk Microfine Glitter – one part Turquoise (626) with two parts Forest Green (633) and apply to the Evergreen as directed. Final touch – a Red Cardinal from CountryScapes – Country Critters 1 (989). Click here for a helpful video on Silk Microfine Glitter. Cut an A6 card (6 1/4” x 4 1/2”) from 100lb. white cardstock. Cut a rectangle from Soft Finish 85lb cardstock 6” x 4 1/4”. Use the negative area from the Clear Double Sided Adhesive Tape as a stencil. Dab Distress Ink/Peeled Paint on the rectangle card. Allow to dry. Emboss rectangle with Elizabeth Craft Designs’ Lots of Dots embossing folder (E114). Adhere rectangle to A6 card. Use Beacon’s Zip Dry glue to apply small amounts to branches and sprinkle with Flora Craft’s Twinklets/Diamond Dust. Add Peel-offs #1064/Silver to edges.